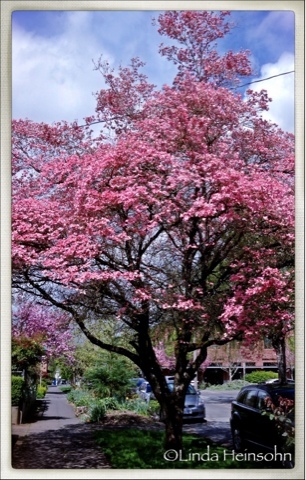 It's a breathtaking time of year now that the pink dogwood has bloomed. Here's one. Linda, this is beautiful!!!!! Thank you for sharing. Thanks, Judy. I still am knocked out every spring when the pink dogwood blooms here. Such beauty! The photo itself, though, I'm not loving. I processed it in PhotoForge2 and never seem to get hi-res results from it. Grrr. I should post the original for comparison so you can see the difference before and after.